With Halloween coming up soon, it is time to think about some spooky Halloween recipes! Halloween Cakes Pops – Spooky ghosts and even some jack-o-lanterns make for some tasty treats. Frankenstein Rice Crispy Treats – Yum! Dark chocolate and rice crispy treats make the perfect duo. Witch’s Broom Snacks – Pretzels and Cheese makes for a tasty snack. Monster Brownies – Kids would love to help you decorate these tasty brownies. Creepy Spider Cake Pops – These cake pops look fairly simple to make. Oreo Cookie Eyeballs – Easy to make eyeball treats. Halloween Oreo Cookie Pops – Make some scary Frankenstein and Mummies with this easy recipe. Pumpkin Cheesecake Truffle Mummies (No Bake) – I think the title speaks for itself – YUM! Ghost Cupcake Cones – LOVE this idea! Monster Marshmallow Cupcakes – Simple and neat idea! Witch’s Cauldron Cake Pops – Takes a bit of work but turns out cute! Purple Candied Apples – I have never made candied apples, but I would love to make these! Haunted Halloween Brownies – Love how they used Peeps for this recipe. Graveyard Pudding Cups – Don’t feel like baking? These are perfect. Oreo Bat Truffles – I love how these little bats turned out. They are too cute. Frankenstein Marshmallow Pops – Looks simple and turned out really neat. Ghostbusters Green Slime Popcorn – You can’t have Halloween without the Ghostbusters! Poison Toffee Apples – Would you eat these? Pretzel Bones – These are easy enough to make. Zombie Boogers – Who are you going to send to collect the boogers from the Zombies for your Halloween party? 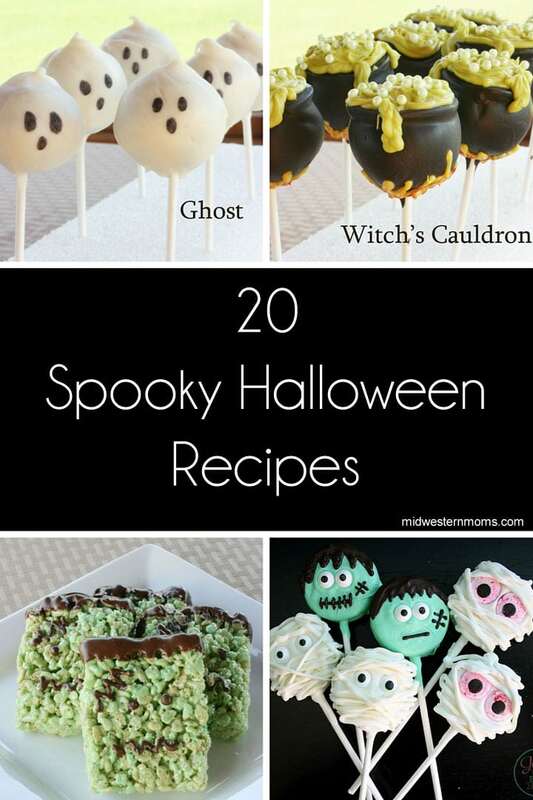 There are many spooky Halloween recipes to choose from. Which ones do you plan to make? Make sure you also check out 35+ Halloween Kid Crafts! What a great round up! Those poison apples looks awesome. Thanks for sharing at the #HomeMattersParty – hope to see you again next week!